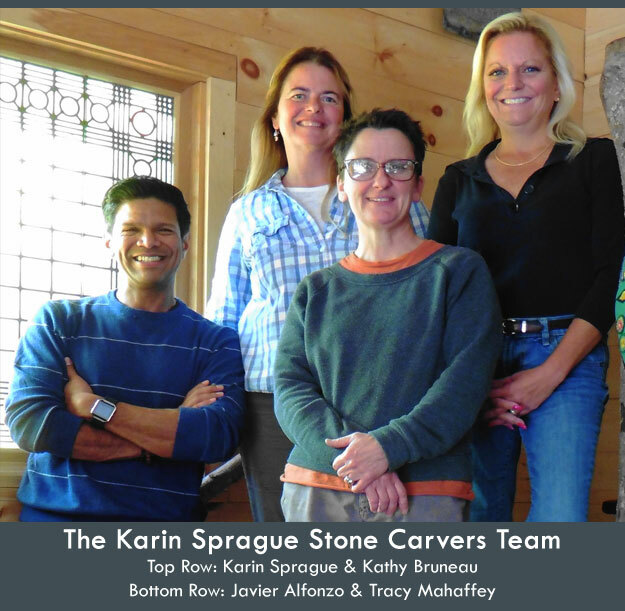 Karin Sprague Stone Carvers, Inc., is a small, highly personalized stone-carving studio nestled in the woods of Northern Rhode Island on the Connecticut border. Karin Sprague and her select team of highly skilled artisans work together to create remarkable beauty that endures. In 1996 after working 12 years as a woodcarver, a defining moment showed up in Karin Sprague's life. Her father-in-law, whom Karin was very close to, died suddenly. A previous two day stone carving class with David Klinger in 1991 gave her the confidence as she felt led to carve her father-in-law's gravestone entirely by her own loving hands. In the midst of carving the first gravestone for her father-in law, an article was written about her in the local paper and Karin received four commissions to carve gravestones for other families. Her true work was discovered. For Karin, creating custom gravestones is not just all business. There is a ministry to her work and a strong sense of compassion and healing. Having grown up wanting to be a priest, yet having an artist's creativity and a deep connection to the earth and nature, this career path has been a perfect fit. Also a perfect fit has been the addition of highly talented stone carvers to the Karin Sprague team. Over the years Karin has taught many classes and apprenticed many students, but it was the addition of Tracy Mahaffey that allowed Karin to step more deeply into her role of ministry and design. Tracy Mahaffey brings the loving and detailed sculptures of Karin's designs to life. Karin met Tracy at the Association of Gravestone Studies Conference in the summer of 2000 and that fall invited her to begin an apprenticeship in Karin's studio. Quite soon Tracy was sculpting major works in stone and has developed into an incredible carver, creating detailed images in stone with her gentle heart and patient hands. Working quietly with her carving tools, she reveals the beauty of the sculpted pieces one skilled chisel tap at a time. In 2014 Javier Alfonzo joined the studio as talented graphic designer, calligrapher and letter cutter. His Zen presence is a welcomed addition. His ability to design beautiful letters and thoughtful layouts has earned him the position of lead letter cutter. Each letter is thoughtfully designed and carved by his hands. Their patience and skill can clearly be seen as they fine-tune the designs according to the will of the stone. Much like Karin must connect and listen deeply to her clients, the nature of stone requires the carvers to honor and listen to the slate itself as it responds to the chisel. It is because of their mastery with the craft that Karin is able to dedicate herself so fully to her clients and the design process. Another reason Karin can dedicate herself so fully is the highly capable Kathy Bruneau. Behind the scenes but never forgotten, Kathy manages the office and keeps the business end of the studio in high order. She graces the studio with her presence as she goes about her work quietly and efficiently, keeping the accounts balanced and the projects flowing smoothly. There have also been several apprentices over the years at the studio, each learning all aspects of the work and sharing themselves with us as they live and learn the art of stone carving. They've immersed themselves in all that we do, from moving stone, carving stone, drawing letters, carving letters, and sculpting images to splitting and stacking wood for the stove in winter. Sharing many meals together, we celebrate living authentic lives surrounded by good work and lasting friendships. "I have been blessed to have an incredibly talented and deeply compassionate team to join me in my life's work," Karin says of her team members. "I am able to minister to my clients so fully and create for them so freely and follow this deep calling for the work that I do because of the work that my team does." Our team of expert artisans use and pursue their gifts and talents by listening compassionately, then designing and hand carving memorials, fostering lasting relationships and shared healing through the "Art of Remembering." Do you love Hand Carved Stone Memorials? So, you share a passion for the art of remembering life. If you are thinking about creating a custom piece for yourself or a loved one, start by clicking view memorials to the right.